Are your "green" electric motor installations at risk? One of the most common improvements to energy consumption in buildings and manufacturing plants is to use VFDs to control motor speeds. This enables the motor to operating at less than full speed, so the motor consumes less energy. Retrofitting your system to include a VFD is usually a simple process and one of the first places companies look to improve their energy consumption. Your local utility may offer rebates for this retrofit, so check their website or give them a call. While VFDs provide many benefits, they can also damage motors by inducing voltages on motor shafts and discharging through the bearings. This can lead to pitting and fluting or even catastrophic motor failure. Premature motor failure and downtime are stumbling blocks to green building improvements. How can you prevent this? One method is an external shaft grounding ring. External shaft grounding rings are simple to install. Some attach via screws others can simply be glued on to the motor. Another way to prevent electrostatic damage is to select a motor with an internal shaft grounding ring. Internal grounding offers the advantage that the motor's frame protects the grounding ring from external elements and damage. If you are planning a "green" upgrade or have recently installed VFDs and would like to know more; give us a call 313-843-6720. 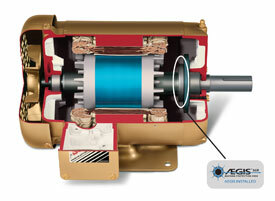 Baldor has expanded their line of American made HVAC motors with internal Aegis shaft grounding.